Home » News » Early-Bird Registration for State Convention Ends Tomorrow, Tuesday June 5! Take advantage of our Early-Bird pricing for the State Republican Convention, which will save you $25, and register by tomorrow, Tuesday June 5! Click here to register and view a preliminary draft agenda for the convention. Click here for information about hotels and other accommodations in Pocatello during the convention. Most convention events will take place at Holt Arena on the Idaho State University Campus. 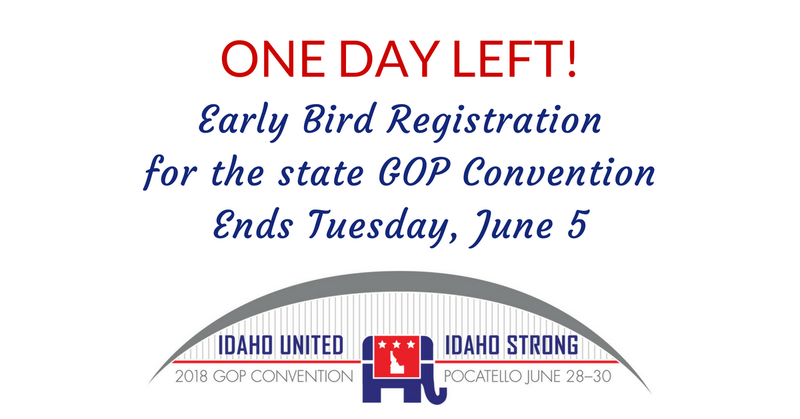 June 4, 2018 / In News / By Idaho GOP / Comments Off on Early-Bird Registration for State Convention Ends Tomorrow, Tuesday June 5!